Rinker on Collectibles: Who’s Responsible for Maintaining Value in a Collecting Category? Wood Auctions could easily schedule 20 or more auctions a year featuring cut glass, but that would flood and prices would plummet. Instead, Woody Auction continues to hold five cut glass catalog sales per year, “cherry picking” the best from the sellers’ collections and offers this material, this way preserving values within the middle- and high-end of the cut glass collecting category for years to come. Although the antiques and collectibles marketplace views itself as relatively free of federal and state regulations, there are laws ranging from caveat emptor and the provisions of the Interstate Commerce Act to state income tax regulations, the Endangered Species Act and firearm regulations that impact the trade. Given the amount of fraud committed by eBay sellers shipping via the United States Postal Service, I am surprised how little crackdown there has been. To put this in perspective, the antiques and collectibles trade is small potatoes/white collar crime, thus avoiding the wrath of federal and state authorizes. Heaven help the trade when the federal and state governments decide to track the amount of unreported cash that changes hands within it. Antiques and collectibles value is manipulated. Those involved are auctioneers, authors, collectors, dealers and others. A broad statement such as this suggests a conspiracy. There is no major conspiracy. Minor conspiracies abound. They are identifiable by those who take the time to look. On July 19, 2013, I was privileged to attend several lecture sessions that were part of the R. S. Prussia Convention held in Grand Rapids. Jason Woody of Woody Auction hosted an informative seminar in which he outlined the operating methodology of Woody Auction. Woody Auction specializes in auctioning ceramic and glass antiques and collectibles. Cut glass is a specialty. During his presentation, Jason commented that his firm has received so many requests to sell cut glass collections that it could easily schedule 20 or more auctions a year. He readily admitted that if Woody Auction did this, the cut glass market would flood and prices would plummet. 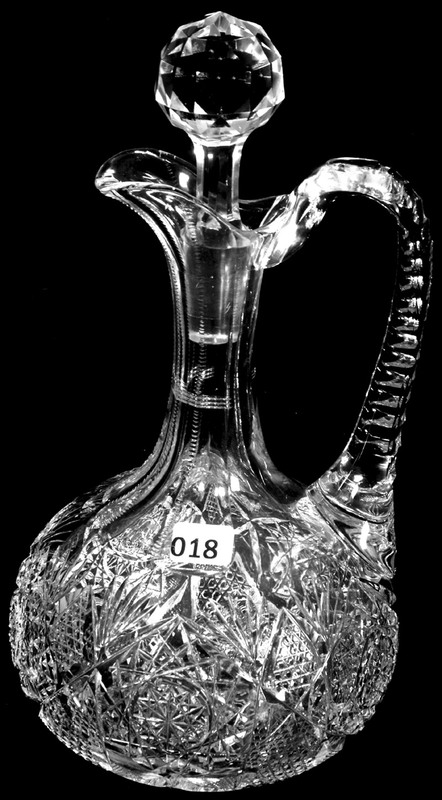 Instead, Woody Auction continues to hold five cut glass catalog sales per year. The firm “cherry picks” the best from the sellers’ collections and offers this material. Jason believes that such a practice will preserve values within the middle- and high-end of the cut glass collecting category for years to come. This is a self-serving practice. Woody Auction maintains its ability to continue to make commissions from cut glass actions. Existing values continue to be maintained. Collectors do well based on the theory that between 60 and 75 percent of a collection’s value resides in the top 20 percent of the pieces. The antiques and collectibles trade is about to face a major value crisis. Within the next 10 to 15 years, dozens of major collections within specific collecting categories will be sold at auction or offered for sale in other venues. The critical concern is how can the antiques and collectibles marketplace absorb all this material and still maintain value. There are many who believe it cannot. A member of the audience at the R. S. Prussia Convention asked Jason what recommendation he had for the sale of the material that his firm did not take. His “it is not my problem” attitude was no surprise. Collector after collector is facing the dilemma of what to do with the five- to 25-dollar-per-object material. New collectors for this material are limited to non-existent. Many of the objects have little decorative or reuse value. Giving them away is not as easy as it appears. I applaud Woody Auction for its willingness to work with collectors in terms of attempting to maintain secondary market values by the careful selection of what the firm sells. Although Woody Auction may be postponing the inevitable, it deserves credit for trying. Some of the larger American auction houses are manipulating the high-end of the market through auction hype and other means. However, every secondary market crashes sooner or later. When the crash occurs, they adjust by touting a new craze. As for their clients who bought at the high-end based on the auction house’s recommendations, the auction house has its cash and the client has the object. It does not take a genius to figure out who the winner is. Auction houses are only sales vehicles. A collecting category is fortunate when a specialized auction firm works closely with collectors to maintain market value. This often is not the case. So, if it is not the responsibility of auction houses to maintain value, where does the responsibility rest? First and foremost, the responsibility rests with the collectors. They are the individuals with the passion and enthusiasm for their collecting category. They are the individuals who can best convince the next generation of collectors to fall in love with their objects. This love has two parts. The first is the histories and stories the objects contain. This love looks beyond the physical object to its inner soul. This soul is what makes the object worth saving. It extends far beyond the “he who has the biggest pile wins” mentality. It is what makes the object great. Understanding the value of preserving the object and recognizing the monetary worth of the object is the second part of this love. Objects only have perceived economic value, not inherent value. Value is created in the mind of a collector and differs with each collector’s mindset. Collectors are self-centered. Sharing is difficult. Collectors see their understanding of the love of their objects as individual and unique. I have attended dozens of collectors’ club conventions. The camaraderie is intense. Unfortunately, these conventions are more mutual admiration societies than vehicles devoted to attracting new collectors. Inevitably the subject of new members arises and a plan of attack is developed. Within a week or two after the convention, the plan vanishes. Collectors’ individuality works against them. They have no common meeting point. They are unable to act in concert. An agreement among some is not accepted by others. Yet, collectors are the primary group of individuals in control of their collecting category. A solution to this Catch 22 dilemma continues to elude me. In the past, specialized price guide authors were instrumental in maintaining value in a collecting category. The trade as a whole relied on these guides to establish market prices. The decline of the general and specific printed price guide has changed this. In the second decade of the 21st century, the Internet sets prices, although understanding how this happens requires an advanced college degree. Author’s Aside: Although price guides, both general and specific, were designed to “report” the market, the truth is that they set the market. Anyone who believes otherwise is a fool. Dealers are the most pressured group to maintain value. After suffering through the 2008-09 Great Recession—mathematically now almost five years ago, although it seems like yesterday—dealers have finally established a set of resale prices in most collecting categories that are stable. Market value has bottomed out. The challenge ahead is: (1) allowing these stable prices to become solidly established; and (2) carefully managing upward growth. Dealers must avoid the temptation to increase prices too quickly; a most difficult thing to ask of them. Like collectors, dealers do not act in concert. The antiques and collectibles trade has no trade association that allows dealers and other sellers to exchange data and ideas. Further, dealers are well aware that “fixing” prices is illegal. Each dealer is free to ask what he/she will. This is what gives a Wild West aspect to the antiques and collectibles market. Although I have chosen to pose this question, I am fully aware that most participants in the antiques and collectibles marketplace could care less. Dealers ask what they want. Collectors pay what they are willing to pay. Auctioneers put objects on the block and, more often than not, let them sell for what they will. Individualism overwhelms the sense of responsibility to the trade as a whole. I wish this was not the case, but it is. Rinker Enterprises and Harry L. Rinker are on the Internet. Check out Harry’s Web site. You can listen and participate in Harry’s antiques-and-collectibles radio call-in show “Whatcha Got?” on Sunday mornings between 8 a.m. and 10 a.m. Eastern Time. It streams live on the Genesis Communications Network. Harry L. Rinker welcomes questions from readers about collectibles, those mass-produced items from the 20th century. Selected queries will be answered on this site. Harry cannot provide personal answers. Send your questions to: Rinker on Collectibles, 5955 Mill Pond Court SE, Kentwood, MI 49512. You can e-mail your questions to harrylrinker@aol.com. Only e-mails containing a full name and mailing address will be considered. Please indicate that these are questions for WorthPoint.